It's hard to find a shady yard without hostas. Plants are primarily grown for their dense mounds of large, colorful leaves. They are available in a wide variety of foliage colors, from green and white to yellow or blue. Many have variegated leaves. It's no wonder hostas are so popular among gardeners; few perennials are as carefree. The plants thrive in shade, but many do quite well in sun. They aren't very fussy about soil. Once established, the leaves shade the ground so well that they crowd out most weeds. They never need dividing, but can easily be divided to produce more. Although grown for their foliage, they do flower. They send up tall stems with clusters of funnel-shaped flowers. Flowers bloom during the summer in shades of white, lavender, and blue. Plants vary widely in size. The largest varieties are three to four feet tall; the smallest are under eight inches. The most common leaf shapes are heart - or lance-shaped, but some cultivars have narrower leaves. Most types grow best in a part shade spot with well-drained, fertile soil. Some also do well in sun. Yellow-leaved varieties typically show better color if they get full sun in the morning. Plants are hardy in zones 3 through 8. Hostas look great in many garden situations. They are attractive planted under trees as groundcovers. They look good at the front of a mixed border. The plants also mix well with ferns or with woodland wildflowers such as bleeding heart and Virginia bluebells. Accent plantings with groups of colorful impatiens. They also look good in container gardens. With so many different types, it's easy to create an interesting garden. Try mixing variegated and solid colored leaves or yellow and blue types. 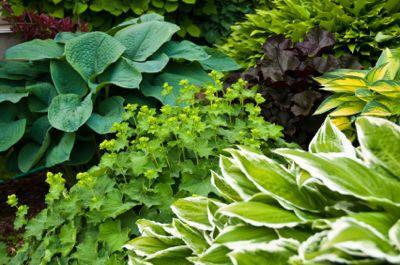 Surround large plants with small and medium versions. Place tall, vase-shaped plants behind smaller low growing versions, so the taller foliage extends like a canopy above the smaller types. The possibilities are endless. When planting, be sure to leave them room to grow. It can take a young plant three to six years to mature to its round, full appearance. Keep in mind that a new garden will look better in its second year, third year, and beyond. If plants do become too crowded, they are easily divided. Slugs are the only major pest, which thrive in the moist, shady areas that slugs love. Slug controls include handpicking, traps, and deterrents such as diatomaceous earth or crushed eggshells spread underneath the plants. Wildlife sometimes find the leaves hard to resist as well. If you have trouble with deer or rabbits, you may need to protect your plants. Separate with a fence or try a spray such as Deer-off or Liquid Fence. Hostas are popular with collectors because there are so many unusual varieties. Plant breeders and collectors come out with new cultivars every year. It's easy to get hooked! Even if you aren't a serious collector, it's fun to try out few different types. Here are just a few of the most popular. Hosta sieboldiana var. elegans is the classic big blue plant, growing 2 to 2 ½ feet tall by 4 feet wide. Blue-grey leaves are puckered. Lilac flowers, which emerge in midsummer, are rarely higher than the leaves. 'Halcyon' is an elegant, medium-sized blue plant with pointed leaves. 'Halcyon' may reach 20 inches high by 40 inches across. 'Blue Umbrellas' is the best blue variety for a sunny site. Large leaves are curved on stiff stems. It grows 24 inches high by 40 inches wide. 'Krossa Regal' is very dramatic. Its blue-green leaves form an upright, vase-shaped clump. Midseason lavender flowers are borne on stems up to 7 feet tall. It can grow to 3 feet tall by 4 feet across. 'August Moon'has uniformly crinkled yellow leaves that hold their color all season. It produces the best leaf color when grown in sun. Midsummer flowers are lilac-white. 'August Moon' grows 20 inches high by 28 inches across. 'Sum and Substance' has huge, glossy, tough-textured, gold leaves that make a profound impact in any garden. Lavender flowers are produced on 48-inch stems in midsummer. It grows 32 inches high by 5 feet wide. Hosta fortunei var. albopicta has eye-catching color. Creamy yellow leaves are irregularly edged in green, which turns two-tone green by summer. It produces lavender flowers in midsummer and grows 20 inches high by 24 inches across. 'Francee' has dark green rounded leaves with distinct, thin white edges. It bears lavender flowers well above the foliage in midsummer. This large spreader grows 24 inches high by 3 feet across. 'Patriot' is one of the showiest variegated types. Its broad leaves are rich, dark green with a wide cream to white border. It produces lavender flowers in mid- to late-summer and grows 20 inches high by 30 inches across. 'Patriot' does well in part shade, but will tolerate full sun.